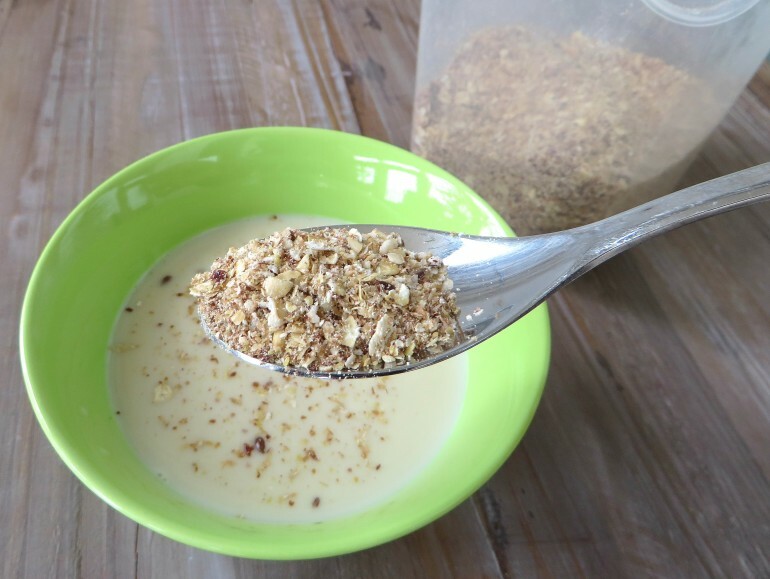 This homemade low carb cereal is one of my favorite breakfasts, especially during the winter months. It's super quick to make. You just mix all the dry ingredients in a jar and then in the morning you add a few tablespoons of the dry mix to some plant milk, blitz it in the microwave or heat it up in a pot and you have a lovely hot breakfast porridge that will keep you full for a really long time. It's a bit like oatmeal, but low carb, and it's very versatile. I like to add some cinnamon and fruit to mine, but you can get as creative as you like. Peanutbutter and chocolate breakfast anyone? You can also vary the ingredients of the mix itself. I sometimes add wheat germ instead of wheat bran, leave out some of the nuts, or even make a nut free version with hemp and sunflower seeds. I got the inspiration for this recipe from 'The Vegetarian Low-Car Diet' by Rose Elliot, specifically the recipe for 'Sarah's hot cereal'. Not all the recipes in this book are good, but it has a few gems. There are lots of vegan options, which is very rare for vegetarian low carb books, which are usually very heavy on eggs and cheese. Put all the ingredients into a large container. Put a lid on and shake until everything is mixed well. Store the mix in a cool place so the flax doesn't go rancid (the fridge is best if you don't plan on using it up quickly). This way it will keep for at least 3 months. In a bowl or cup mix 3-4 tablespoons of the dry mix with 1 cup (250 ml) plant milk and the optional cinnamon, sweetener and fruit. Put it in the microwave and cook on high for 1-2 minutes. Stir well and let the mixture sit for a minute so it can thicken into a nice porridge. I could not get this porridge to thicken. It remained like a watery soup. I used for tablespoons to 250 ml of coconut beverage . I don’t know about anyone else’s microwave but one minute would not heat nondairy from the fridge. I tried heating it longer to bring it to boiling, but still didn’t seem to be enough to thicken it.I did use walnuts instead of hazelnuts, but ??. Should I be doing something different? Hi Ale, that's weird. For me it thickens up very nicely when I heat it and then it thickens more if I let the cooked porridge sit for a while. Did you make the dry mix exactly as written?